On November 12, 2009 at the Altman Building in NYC, guests were introduced to a secret society filled with High Fashion, Tapas and Sherry. 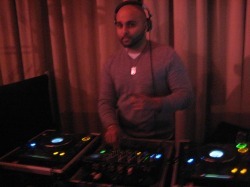 Jay Sean's official DJ Bikram Keith was spinning the sounds for the event. As the night progressed guests learned about the foundation of "Fashion Fights Poverty" which is a non-profit organization that was founded in Washington, DC. Their mission is to is to raise awareness for initiatives that encourage and support creative, effective, and sustainable means of challenging poverty. They believe that the industries of fashion, textiles, and design offer unique and effective opportunities for designers, craftsmen and consumers alike to contribute to the alleviation of poverty through trade, skill-building and community empowerment. The Fashions modeled seven looks that were inspired by the seven styles of Sherry from the Secret Sherry Society. The designer, Stella Bonds presented a fashion show that featured bold creative and unique designs. Stella Bonds designs unifiy old world style and elegance with a modern twist. During the fashion show the models carried around a gold box holding a secret and alternated between showing the audience the box and passing it to the next model. At the end of the show, each model held an illustration of their unique look that was auctioned off to support Fashion Fights Poverty.